Self-issue machine will not work. 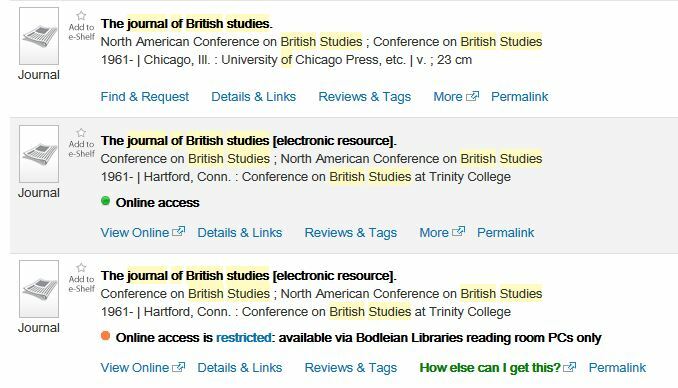 To search for books and journals held in Oxford, use COPAC – though bear in mind that it will not display the up-to-date status of a book, e.g. when it is due back from loan. Apologies in advance for the inconvenience caused. Do contact library staff if you need any help. As more and more monographs also become Open Access, our colleagues in the Bodleian Library are cataloguing those so they can be found and accessed via SOLO. You can then use the facets on the side to explore which subjects are covered. Look out for more Open Access monographs. They are freely available and, now that they are integrated into SOLO, should also be discoverable in addition to our purchased and Legal Deposit collections. 1. Online access indicators – prominent green dots show where we have the item online and also notes the existence of physical copies. electronic Legal Deposit items display an orange dot. 2. 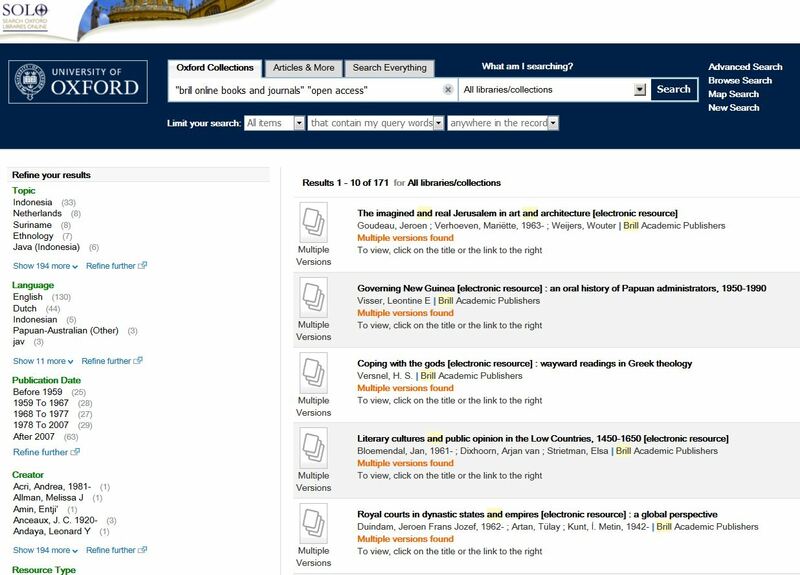 Info buttons in Find & Request tab – these currently link to the library information pages at http://www.bodleian.ox.ac.uk/subjects-and-libraries/libraries 3. Browse related titles – any book records with a Library of Congress or National Library of Medicine classification field will show results with pictures of book covers underneath. This allows readers to scroll through books with adjacent classification numbers. Permalink – a stable url is now provided more prominently, giving you a quick way to copy the link to a particular result in SOLO to send to a reader or refer to in a guide/reading list. The previous ‘link to this record’ links are no longer visible although they will still work. if you try leaving an open SOLO session unused for a while (up to 30 minutes, which is the official timeout period), you should now be able to continue with the same session. The software that powers SOLO, the Bodleian Libraries’ online catalogue, will be upgraded tomorrow. While SOLO will function the same following the upgrade, the new version of the software brings with it various additional new features, many of which have been requested by readers. 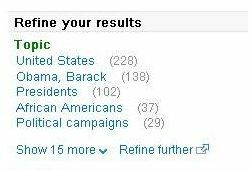 The new browse search allows users to browse records using A-Z lists of authors, titles or subjects. The browse lists cover the holdings of the majority of libraries within the University, but they do not include the databases indexed in OxLIP+ or research papers and theses indexed in the Oxford Research Archive (ORA). You can browse OxLIP+ or ORA within their own dedicated search interfaces. This is a new option in the advanced search screen which allows users to limit searches by specifying a publication date range. Results from the search will only include material where the publication date falls between the start and end date set. The facility to export records to reference managers has been greatly improved in this new version of SOLO. It is now possible to export directly from individual records without saving to e-shelf and to export to desktop reference management software such as Endnote and RefWorks. It is now possible to refine your results using more than one option in the facet list on the left-hand side of the page. To do so, click on ‘refine further’. This will also offer the option to exclude facets. Please note: Readers using the “Libraries” facet are strongly advised to avoid excluding libraries. This is because if an item is held in a number of libraries and you choose to exclude one of them, you will not see the item at all, even though it is also available in other libraries that you have chosen to include. For example, if you exclude the Bodleian, you will not see items in other libraries if they are also held in the Bodleian. To refine your search by library you are advised to use the “include” option but not “exclude”. We continue to work to develop and improve SOLO, and welcome comments via the feedback link on the SOLO front page. For help and guidance using SOLO, please see the SOLO online guide or ask library staff. 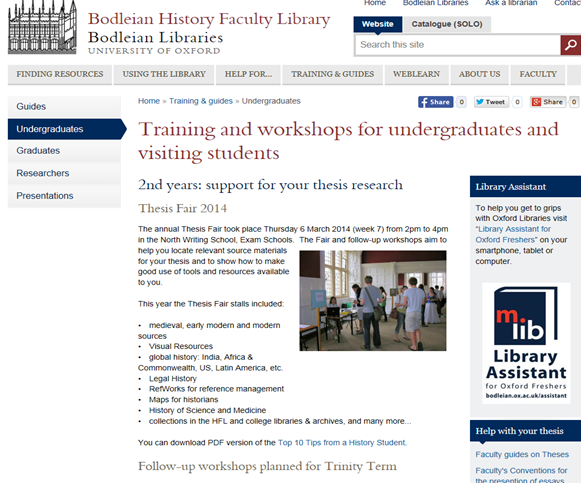 The Bodleian Libraries Live Help service is also available on the SOLO front page from 9am-5pm on weekdays. A significant upgrade of the underlying library software (from which SOLO takes much of its content and data relating to item availability etc) means SOLO will be unavailable between 8am on Saturday 3rd August and 9am on Monday 5th August. How do I find out what is held in Oxford during this downtime? Can I still renew books or place holds online? No, unfortunately during this time patron functions are not available. Please contact the owning library if you need help. For enquiries relating to HFL books, contact HFL staff. Can I still access databases and ejournals? Yes, you can still access our database and ejournal subscriptions via OxLIP+. The problems encountered by some readers trying to access the My Account area on SOLO and log in to the Bodleian Libraries wifi network have now been resolved. If any readers are still having problems logging into services using their library card details please contact us. At midnight on 5/6 April 2013, new legislation came into force allowing the Bodleian Libraries and the other Legal Deposit Libraries in the UK and Ireland, to access electronic books, articles, web pages and other electronic documents published in the UK. This is the electronic equivalent of print legal deposit, the legislation which has allowed the Bodleian Libraries to receive a copy of every item published in print in the UK since 1662. 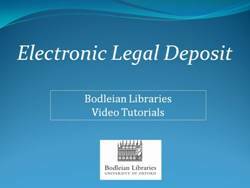 Bodleian Libraries will be referring to this new material as Electronic Legal Deposit (eLD). Watch this SOLO Video Guide for an overview of the regulations governing the use of electronic Legal Deposit materials and guidance on how to access them using SOLO. 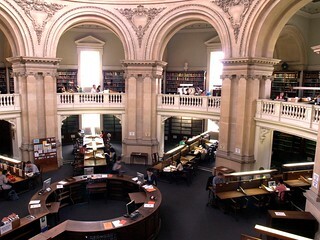 eLD items may only be accessed from Library computers in the Bodleian Libraries. You will therefore need to use one of the Libraries’ public workstations rather than your own laptop or device. Each item on eLD may only be viewed by one person in the Bodleian Libraries at a time. If someone is already using the eLD item that you want, you will need to come back later. In addition to these legal restrictions, due to technical issues in the Bodleian Libraries you will only be able to access eLD items from the Mozilla Firefox browser. You will not be able to access them from Internet Explorer. You will be able to find and access articles and books deposited via eLD using SOLO. The SOLO search screen now has four search tabs, two of which can be used to search Electronic Legal Deposit. More details, how to use SOLO to include and exclude eLD materials, and for information about further support, check out the Bodleian Libraries eLD guide.